Elizabeth Sarah b.1878 – d.1950. Married Arthur Henry Thorne in Southampton in 1897. William John H b.1880 – d.1968. Harry Robert b.1883. 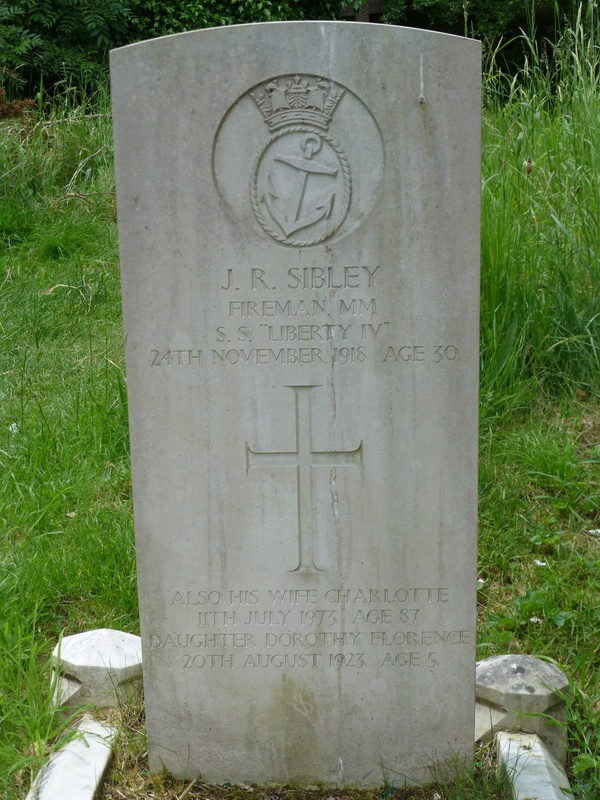 There is a death for Harry R Sibley in Southampton in 2nd quarter of 1918 and also a WW1 medal card for Harry R Sibley of the Royal Army Service Corps; however there is no proof that this is John’s brother as no service record found. Kate b.1890. There are no birth records for ‘Kate’ but there is one for Mary Emily K. This is probably John’s sister, as her mother’s name is Mary and she may have been known as Kate. In the 1891 census John junior is living with his parents and siblings Elizabeth, William, Harry and Kate at 43 Coleman Street, St Mary’s, Southampton. Also living here is John junior’s cousin Emily Miles, aged 21 years. Following the death of his wife Mary Ann, John married Eva Mary, nee Hooper (b.1868 Taunton, Somerset – d.1926, Southampton) in 1899 in Southampton. She was married twice previously in the names of Baker and Peters. From each marriage she had a son William Baker (b.1887 Wales) and Harold Peters (b.1897 Southampton). By the 1901 census John junior is still living at the Coleman Street address with his father, stepmother Eva and two new sisters have arrived by this time, Alice and Emily. William is boarding at 34 Grove Road, St Mary’s, Southampton with the Englefield family. Robert W R b.11/05/1915 – d.1994 on the Isle of Wight. Married Sylvia J Baker in Southampton in 1942. Ida R b.1916. Married William Frederick in Southampton in 1939. John Robert served as a Fireman on the yacht S S Liberty IV which was used as a hospital ship during the war. The Return of Deaths at Sea would indicate that John died at sea; however he in fact died in his home town of Bronchopneumonia, a form of bacterial pneumonia, which was the main secondary infection of Spanish Flu. The pandemic lasted from approximately July 1918 to April 1919 with a major peak in the UK between September 1918 and January 1919. It can be assumed that the vast majority of illness deaths in these periods were due to the Spanish flu. So maybe John Robert was, indeed, a victim of the great Spanish Flu pandemic of 1918/20. When John died on 24th November 1918, his family were living at 15 Chapel Road, Southampton. This cemetery is on the Common and was made in 1846 under Act of Parliament. It contains 99 Commonwealth war graves of the 1914-18 War, a plot of 21 1914-18 War Belgians and 15 Commonwealth war graves of the 1939-45 War. have played football again at a notable level. We would like to thank David Bull, Duncan Holley and Gary Chalk, fellow authors of All the Saints for providing us with information about John Robert – his short career with the Saints and clarification of the nature of his illness and subsequent death, for their kind donation of this book from which the above information has been copied and for their interest in our work. This book and other publications are available for purchase from Hagiology Publishing. David Bull, Duncan Holley and Gary Chalk of Hagiology Publishing.